The flower garden of the poultry world, are miniature chickens, usually one-fourth to one-fifth the size of standard varieties. 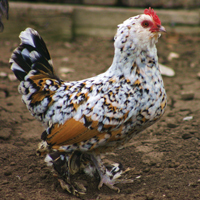 Because of their many different types and assortments of color patterns, raising bantams is rapidly becoming one of today's most popular hobbies. 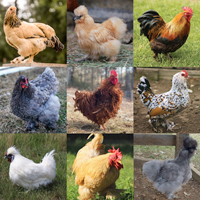 Little is known of the origin of bantams although they are believed to have come from the Orient. To help ensure a safe arrival, the minimum number of Bantam chicks for any chick order is 15. The buff is the newest variety to be recognized in the U.S., and because of this is more difficult to find. The beautiful golden buff bodies with black tails and laced hackles make them an extremely attractive bird. 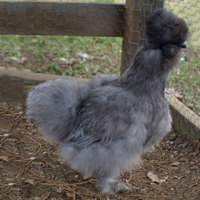 They have all of the qualities of the other silkies but will vary in feather color. Approximatley 50% will be Blue the others will be black, white, and black/white combinations. They have many unusual characteristics and their reddish-bay feathers that are tipped in white really make them stand out. Their colors will get better with age and they are very nice birds. Their black skin and feathers that feel much like hair make them one of our most unusual varieties of chickens. 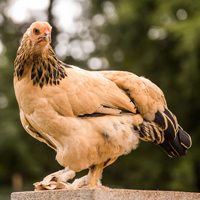 They are striking in appearance with their white plumage and mulberry colored comb, face, and wattles. The ear lobes are a light blue turquoise and the skin is dark bluish/black. They are a table delicacy in the orient. The Porcelain has all of the same characteristics of the Mille Fleur except that the base color is a pale blue rather than red. All feathers are tipped in white making it one of the prettiest chicks at the hatchery. 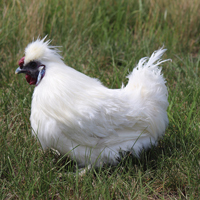 Their black skin and feathers that feel much like hair make them one of our most unusual varieties of chickens. 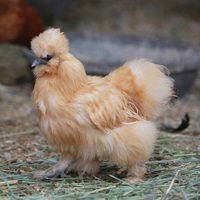 Our Silkies come both bearded and non-bearded and are tremendous setters on all types of eggs. 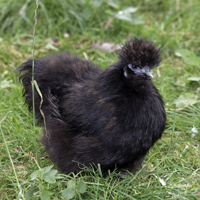 They are buff colored with the same black skin of the other silkie varieties, and mulberry comb, face, and wattles. These are fairly rare and we have a limited supply of them. 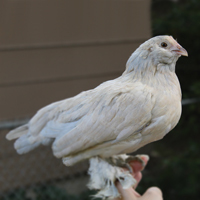 All purebred bantams with feathers on their shanks and toes. Our choice of at least 4 different varieties.